A friend of mine was uprooted from India and had to travel to Helsinki, for a couple of years, along with her husband, way back in 2004. She would write long delicious emails of her experiences there as she tussled and tackled her alien yet fascinating world. The interesting facets of her journey would be more enticing as they unfold in the first person narrative. Hence, I am putting across her narrative in the first person. It’s difficult to express what we feel now, especially after the passage of the initial dazed, confusing phase and a slight euphoria. Our flight from India to Zurich was mostly uneventful, except the slight anxiety of being allotted different seats in a full flight. We managed to stick together by exchanging seats with an extremely kind gentleman. (As Indians we are not exposed to these small yet delightful acts of kindness. In one of our flights within India, we were travelling for our honeymoon. The elderly gentleman refused to part from his allotted seat. Throughout the journey, he took sadistic pleasure in planting himself right in the middle of both of us). We slept through the journey, mostly. We had to take a connecting flight at Zurich for Helsinki. Zurich in Switzerland is a small place with an extremely well-maintained airport. From information booths, helpers, clean and polished bathrooms, etc, transporter vehicles, to an underground metro connecting our disembarkation station airport to our departure station airport- they all dwarfed out our international airport in infinite ways. (My friend had written this at a time when betel-stained seats adored our airports and Terminal 3 was an alien concept for India). We lamented these differences and pondered about what sorry signals our stained carpets, unclean restrooms, slag personnel’ sent out to visiting foreigners. We could not see much of the famous Swiss landscape from the inside of the airport, but we did catch a glimpse of the Alps. As the plane approached Helsinki, my 5-year-old daughter and I saw long stretches and patches of white and grey. I pointed out the miles and miles of what I presumed to be snow to an elated Savy (My friend’s daughter). My husband laughed at me saying my enthusiasm is playing tricks with my eyes. It can’t be snow, just water looking hazy from such heights. It was only when the air hostess asked us about our air view of the sea of snow in Finland, that he conceded, wide-eyed and happily. In fact, all three of us were wide-eyed. It was hard to contain my daughter from running right out and touching the pearly snow all around once we had landed. Outside it felt like being inside a fridge. Our noses resembled a clown’s red stub after being outdoors. Now, we are getting used to the cold and the first signal of this was when I saw the thermometer (hung right outside our little kitchen window) and Savy remarked that the weather is good today, just -5 degrees. In the mornings, the temperature is mostly -10 now. Towards the afternoon, it gets better. The worst phases of winter is said to be over. Those are the times when the mornings are dark and the sun is seen for a few hours only. We didn’t get to see that part and hope we’ll be back before the next winter. We are yet to concede to the fact that Helsinki summer has arrived. Huh! From our living room window (overlooking a park), the amazing sights of parents and children rolling happily in the snow even during the evening hours often confront us. Unlike Delhi’s pet dogs in winter, the pet dogs here are more weathered. We based these assumptions on our observation that the owners here do not attire their dogs in clothing. There will be a summer vacation of about 2 months from 15 June. People try to spend their time enjoying the short summer. I’m very happy about one thing; Avi will be home every day from office around 5-6pm. They literally push people out of office after 6pm. Poor Avi, his work alcoholic days are numbered. Over here, children go to playschool until the age of six. Savy is very happy with her playschool environment, with no homework and negligible studies. Really, do we Indians put too much of pressure on our kids academically? I do not know what the pro and con of this is. Old habits die hard and being an Indian parent I make sure I keep myself updated with the Indian syllabus according to Savy’s class, and try to teach her at home according to that. Savy feels exotic with her new name at school (given by the children): black-haired girl. She loves the school pet zoo, which has an eclectic and peculiar mix of animals like lizard, beetle, starfish, chameleon etc. We have to get used to one more peculiarity- wishing each other a goodnight’s sleep while the sun still smiles down at us. The land of the Midnight sun did not fail to astound us. Our living quarter here is located in a posh locality (going by the local people’s version). Both of us were a little uncomfortable about the small size in the beginning. Now we are well settled and quite comfortable in this house. The house is very well furnished with every single article one can conceive of in just the right place. The living room is very spacious. The wardrobes are more than enough for us. The kitchen, bathroom and bedroom almost resemble a dollhouse. Having graduated from the initial cramped feeling, we now classify them as cute, convenient and cozy. At least I do not have to waste time cleaning up. There is a dishwasher and microwave oven and everything is well provided for in the kitchen. We are learning a few lessons in space management and how people save time here. There is a four-plated hot plate, an adorable small fridge (my initiation to mini-fridge, less than half my size), there is an enclosed bath area and Savy thinks it is for Barbie girls. Of late, we discovered after the initial ranting and raving that the washing machine can actually house much more than 2 clothes. We had been feeding the outer rims of the machine until we stumbled on the right way to open it. More ever our clothes came out as if they have just been at a battle. Thank God, I discovered it within 2 days of our arrival. Machines and machinery can be crafty at times. However, the clothes cannot be dried on the cloth liner outside in the balcony, of course, unless if we want them crispy and cold as ice in the morning. Ahh! Then I found out where the dryer of the washing machine was. Apart from these small inconveniences if it can be called so, everything else is hale and hearty in the house. I especially like the small cot and study table that Savy has for herself here. Quite a few good books have kept me thoroughly occupied as of now. I do not miss not seeing Indian TV programs. I keep rummaging around the shelves and drawers discovering new things useful like needle and thread box and some whose use I am yet to discover. Sometimes Savy watches the Finnish cartoons that come at 5 PM and now Avi has started getting the laptop home, where she can watch her DVDs. With no distractions like TV, she is developing the habit of eating on her own just by watching outside the window. She is quite happy and very occasionally misses her cartoons. We are charmed by the grand architecture, and sculptures of this place. Savy, however, is quite intrigued by most of the sculptures. She does not understand why in a cold country like Helsinki, the statues are not at all dressed. 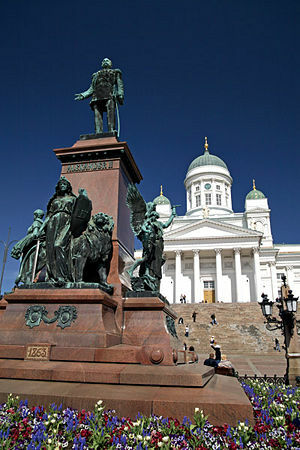 Helsinki is a quiet and quintessential European town lined by a lovely bay line. While living here, I realize what space management actually is all about and how little is actually required to live. There is a tram, bus and taxi stand just in front of our house. Commuting is not going to be a problem. Avi’s office is hardly 10 min by tram from home. We have worked out that he will leave Savy at school in the morning at 8 AM and I’ll collect her at 12 Noon. There is an option of opting for a full day until 5 PM, which we might take up after Savy gets used to this place. We will be getting a car soon and then we can start going on little adventures in this place. One thing people have warned us about is going for a walk or skiing along a long snow stretch. With lakes and sea frozen from above it’s difficult to know where the ice is not thick. Many people lost their lives when they were not careful about fragile ice points. Wearing heels and walking on the street’s (though cobbled) is a tricky affair. I have skidded and fallen twice. Uff! We feel like overburdened donkeys, with all the clothing we have to wear while venturing out on the street. People are very courteous and smile a lot. I have been taking to Savy to school for a week now but haven’t seen any Asian faces in the tram. Meeting friends, seeing familiar faces is one thing I miss. I am sure with time, we will like this place better we have developed a circle of friends.